The constellation Hercules is directly overhead as seen at 9:30 pm local time from midnorthern latitudes. As the sky grows dark on very clear evenings this week, anancient star pattern can be found almost directly overhead: Hercules, themighty strong man and hero of many legends. The stars that compose this pattern are, for the most part,rather dim, and it seems rather incongruent that for such a powerful figure,the representative constellation is rather weak. Indeed, there is really nostriking pattern to be found here. It is supposed to represent a kneeling manand was known as the "Kneeling One" in pre-Greek cultures. A check of a number of various stargazing guidebooks mightsuggest you look for a large crooked letter H, or even a butterfly that can betraced out in several different ways. In "The Stars/A New Way to SeeThem," author H.A. Rey (1898-1977) managed topicture Hercules as a kneeling man swinging a club. 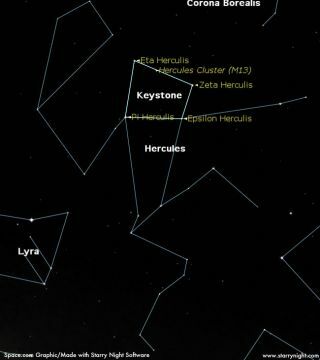 Within the center of this constellation is a pattern that isoften labeled the "Keystone," and is composed of Eta, Pi, Epsilon,and Zeta Herculis. It is an asterism, which is defined as a distinctivegrouping of stars forming part of the recognized constellation outlines, orlying within its boundaries. Ranging in size from sprawling naked-eye figuresto minute stellar settings, they are found in every quarter of the sky and atall seasons of the year. The larger asterisms – such as the Big Dipper in UrsaMajor and the Great Square of Pegasus – are often better known than their hostconstellations. Some might not be acquainted with what a keystone is. Manyarches are built with a large, central stone that helps to make the arch selfsupporting. The keystone was one of the most significant ancient architecturaldiscoveries, along with the vault. Pennsylvania acquired its nickname "TheKeystone State" because of its central location among the 13 originalAmerican colonies. If you have ever traveled on "America's First Superhighway," the Pennsylvania Turnpike, you might recall thekeystone symbol found on its traffic signs. And the keystone symbol can also befound on the logo for the Little League (whose World Series is played in Williamsport, Pennsylvania). Admittedly, the Hercules Keystone is slightly lopsided, butthen few star pictures are perfect (even the famous Great Square of Pegasuslooks more rectangular that square-like). A third of the way down the Keystone'swestern edge is the famous starcluster M 13, which may be glimpsed with the unaided eye. It is acelebrated object; the brightest and most dramatic example of a globularcluster north of the celestial equator, often referred simply as "TheGreat Hercules Cluster." It's a concentration of over 100,000 stars, locatedat a distance of roughly 23,000 light years from us. Globular clusters are masses of stars that typically lie onthe outskirts of our galaxy. If you have good binoculars, you should have no difficultyin locating M 13 for it will appear as a hazy-looking "star" of aboutsixth magnitude (which is about the threshold of naked-eye visibility). In asmall telescope it will appear as a bright, round nebula about one-third theapparent size of the Moon. With a 4 to 6-inch telescope, the round glow beginsto become resolved into hundreds of tiny star-points. In telescopes of12-inches or larger a truly memorable view is obtained. Astronomer Robert H.Baker (1880-1962) called it a "wonderful chrysanthemum of stars." For those who regularly attend the annual Stellafaneconvention, just outside of Springfield, Vermont (which in 2007 takes placeAug. 9-12), the Great Hercules Cluster is the object that Stellafane's 12-inchPorter turret telescope is directed toward most often. Many years ago, the legendary deep sky observer, WalterScott Houston (1912-1993) – known as "Scotty" – noticed a long lineof people patiently waiting their turn to get a view through the eyepiece. "What are you folks looking at?" he asked as he poked his headthrough the observatory door. From out of the darkness, came the response: M13. "M 13?" replied Scotty, with a tinge of incredulity. "So manypeople have looked at it you would think it'd be all worn out by now!"